If you believe the end maketh the movie, then writer-director Sujoy Ghosh’s Kahaani 2: Durga Rani Singh falls strictly in the category of the not-extraordinary. The second instalment in this series starring Vidya Balan features nothing like the surprise that punched us in the collective gut in Kahaani’s climax back in 2012. Before the end comes the beginning though, and there is much to recommend in the journey between those two points here – the atmospherics, the pall of disquiet blanketing the narrative, the unusual subject, locations rarely explored by Bollywood (Kalimpong and Chandan Nagar in West Bengal in addition to Kolkata), the cast, and most of all, Balan. Kahaani 2 begins with a young single mother in Chandan Nagar hanging out with her bedridden daughter. We soon learn that when Vidya Sinha is at work, she has a nurse coming home to take care of Mini who is paralysed from the waist down. Vidya wants to take her daughter to the US for treatment that she hopes will give the child back the use of her legs. She persists with this belief although her kindly doctor in Kolkata cautions her against being too optimistic about a cure. Then one day an abduction followed by another tragic turn of events ruptures their happy, middle-class existence. Who is that voice on the phone threatening to separate Mini from her mother forever? Will this Vidya – like the redoubtable Vidya Bagchi of the first film – thrash aside all obstacles to attain her goal? Keep guessing. What made Kahaani an absolute killer was that its entertaining, layered storytelling was followed by a disclosure through which we realised that nothing had been what it seemed through the film. Kahaani 2 features many disturbing and mystifying individual elements. It also delivers some shock treatment for viewers midway through the first half. Ultimately though you realise that most things in the film were more or less what you thought they were when they first rolled by and the big reveal is just so-so. The ending may not deliver the goods, but Balan certainly does. The media has for years now discussed her willingness to take on the physical attributes of the various characters she plays. While that is no doubt a remarkable quality, to focus on that alone would be an injustice to this fine artist since physical quirks can be used as crutches by average actors too. Balan’s strength is her ability to drown out her own personality for a role. 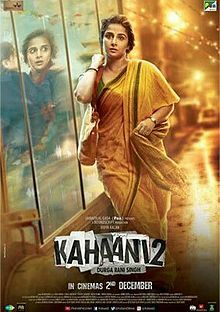 And so, here in Kahaani 2, there is not a trace of the hard-as-nails heroine of Kahaani, the overtly sexual, bubbly Silk from The Dirty Picture (2011) or the brazenly manipulative Krishna from Ishqiya (2010) who had no qualms about purring out the words “chutiyam sulphate”, at a time when the industry’s heroines were usually identified by their coyness. When Vidya/Durga in Kahaani 2 recoils at the first touch of a man she loves, the actress convinces us of her character’s diffidence and fears. As a distraught mother and a victim of social indifference, she does what we have come to expect of this formidable star: she erases Vidya Balan to become the person she is playing, Vidya Sinha. The rest of the cast offers no equivalent of the lovely Parambrata Chatterjee and Nawazuddin Siddiqui from Kahaani, but it is still good to see an evolving (dishy as always) Arjun Rampal playing the policeman with a past, Inderjeet Singh, and Jugal Hansraj – the little boy from Masoom who grew up to a lacklustre acting career – surprisingly effective as a creep. The incredibly cute Naisha Khanna and the interesting youngster Tunisha Sharma – both playing Mini at different stages of her life – get limited space to showcase their talent, but are clearly worth watching out for. Though Kahaani 2 has none of the memorable detailing of satellite characters that made Kahaani outstanding (where are you, Bob Biswas?) it is unobtrusively insightful in its own way. The long-term effects of sexual abuse, victim blaming, the politics in the police establishment and small-town life are all dealt with effectively. I enjoyed the sweetness of the brief romance between Vidya/Durga and her beau Arun (Tota Roy Choudhury, nice! ), his kindness to her and his non-aggressive wooing. And there is a refreshing, believable normalcy in the relationship between Inderjeet and his wife played by the sprightly debutant Manini Chadha. The big let-down in Kahaani is the writing of the climax, whether viewed in isolation or in comparison with its remarkable predecessor. For the record, these are the credits: Screenplay – Sujoy Ghosh, Dialogues – Ritesh Shah & Sujoy Ghosh, Story – Sujoy Ghosh & Suresh Nair. Ghosh, who is so confident in his conceptualisation till that point, is clearly aiming at a similar sock-the-viewer-in-the-neck impact as before, but comes up instead with an unimaginative, more or less predictable whimper. To be fair, his deft direction and Namrata Rao’s skillful editing ensure that there is not a moment of boredom right until then. The two have found a good match in DoP Tapan Basu, production designers Kaushik Das and Subrata Barik who together manage to make the film’s small and large spaces feel cloistered and intimidating, while lending unexpected warmth to Vidya and Mini’s tiny home in Chandan Nagar. Clinton Cerejo’s music gently wafts around the film and then ends with a bang: the neatly orchestrated, energetic rendition of Rabindranath Tagore’s Anandaloke mangalaloke accompanying the end credits is so haunting that I stuck around for the very last word to disappear from the screen.